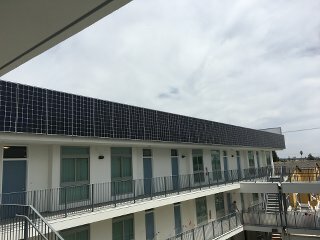 Silver Star Apartments is the first Zero Net Energy multifamily affordable housing development in Los Angeles. Promise Energy designed and installed a Solar Photovoltaic system that covers both roofs on the project, and even incorporates vertical solar facades as a unique design element, visible from the project's courtyard. The 49-unit building in south Los Angeles, developed by local nonprofit A Community of Friends (ACOF), will provide homes and supportive services for formerly homeless veterans. Silver Star is LEED Platinum and Energy Star Homes certified, and aims to meet the "Living Building Challenge" Energy Petal Certification as well. Silver Star recently won the Sustainable Innovation Awards Project of the Year for 2017 from the Los Angeles chapter of the US Green Building Council. Dominique Hargreaves, Executive Director of the US Green Building Council – Los Angeles said, "We appreciate the time and energy it takes to deliver these types of high-performing projects. The jurors of the Sustainable Innovations Awards appreciated the innovations that you documented and agreed that your project was way beyond rating system requirements or code and really demonstrated excellence in design and construction as well as providing much needed supportive housing." ACOF engaged Promise Energy at the very beginning of the design process to collaborate with FSY Architects, and energy consultant Green Dinosaur to make the building as efficient as possible, and then fit enough solar PV to offset 105% of all site energy use, to make the building net positive. Special attention was paid to the solar orientation of each façade, and during the design process, the roof was expanded, and finally solar panels were placed vertically on the building to enhance production in order to meet the project's aggressive sustainability goals. 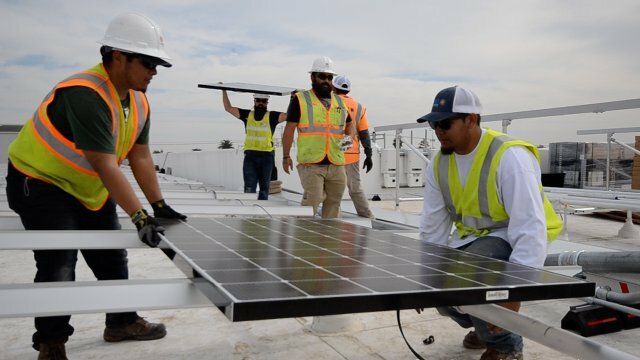 "Thanks to Green Dinosaur and Promise Energy, this building is completely solar powered," says Dora Gallo, Chief Executive Officer at A Community of Friends. "This project demonstrates how affordability and environmental sustainability can be achieved with effective coordination and a great team. Despite our incredibly aggressive goals, we were able to get the project completed on time and on budget by working together. Promise Energy was an integral part of the team from the very beginning, and their enthusiasm and dedication throughout the process was critical to making Silver Star not just an incredibly energy efficient building that produces all its own power, but a safe, comfortable community for our tenants to call home." Silver Star includes a number of sustainability features in addition to delivering zero net energy, such as quality air sealing and insulation installation implemented to greatly reduce envelope leakage and HVAC loads, as well as phase-change material in the walls to reduce heat gain. 100% of the units are ADA compliant, using universal design features that will assist residents as they get older onsite. Silver Star's proposed greywater system is expected to reduce potable water demand for the project by 40%, saving an estimated 500,000 gallons of water per year. Jason Lorcher, founder of Green Dinosaur said, "This was an exciting project to work on, not only because of the challenges we addressed, and the innovative solutions we delivered, but because of the commitment of the whole team to making this a truly high performance project. Delivering Zero Net Energy in a dense urban setting requires incredible attention to details - like how hot water is generated and distributed throughout the building, and every square inch of insulation to make sure that energy is not escaping or being wasted. Promise Energy was a great team player, assisting with multiple redesigns to meet our Zero Net Energy targets, as well as focusing on quality installation to ensure these systems will operate efficiently for years to come." "Silver Star really proves that mid-rise urban buildings can be completely carbon neutral and produce all the energy needed for 50 people to live comfortably even in Los Angeles," said Adam Boucher, Founder and Chief Executive Officer of Promise Energy. "Silver Star Apartments will keep people cool even during the hottest days and provide a safe space even during extended blackouts, without relying on fossil fuels. This project is both a way to give back to the people who have served us, as well as building a model for a healthier, more resilient future." At the Grand Opening of this award-winning project, on Friday, November 17th, Mayor Eric Garcetti hosted Los Angeles County Board of Supervisors Chair, Mark-Ridley Thomas, and city officials in a historic signing of a Memorandum of Understanding formalizing the county's commitment to provide health services and case management for residents while the city continues to develop affordable housing projects. "The fight to end homelessness belongs to everybody in Los Angeles," said Mayor Eric Garcetti. "We're standing together at all levels of government to get people the shelter and services they need more quickly and efficiently than ever before."